Well, he dodged one bullet. But will he remain in the Senate? Who knows. This guy has had a rocky road to Capitol Hill. Sangamon County State’s Attorney John Schmidt declined to press perjury charges against U.S. Sen. Roland Burris (D-Ill.) stemming from allegations he misled a legislative panel about the circumstances behind his appointment. Schmidt said that while Burris’ answers to the House committee probing former Gov. Blagojevich’s impeachment were “incomplete,” and vague, that did not rise to the level of a crime. 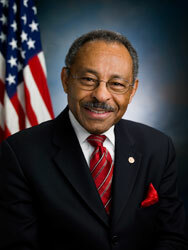 “Based upon our review of the facts and the applicable law, there is insufficient evidence to charge Senator Roland Burris with perjury,” Schmidt wrote in a letter to House Speaker Michael Madigan (D-Chicago), whose office encouraged the probe. Posted: 6/19/09 at 2:55 PM under News Story.